(ICCI): The International College of the Cayman Islands (ICCI) will hold its 13th Annual J. Hugh Cummings Memorial Walk this Saturday, 15 February. The Walk this weekend will serve two purposes: to honour the memory of the college’s founder, Dr. J. Hugh Cummings, who founded Cayman’s first college in 1970, and to raise funds for the J. Hugh Cummings Memorial Scholarship Fund for students who are in need of financial aid. Limited financial means continue to affect many students at ICCI and the college hopes to raise CI$30,000. Current corporate sponsors for the J. Hugh Cummings Memorial Walk are: Cayman National Bank, Foster’s Food Fair, Island Taste, Corim Consulting, and Conyers, Dill & Pearman. All additional sponsorship is welcome. Students who will benefit from the proceeds are those who need additional assistance with books and tuition or perhaps may not have jobs but wish to continue to pursue or complete a degree in order to prove themselves competitive in the job market. Suggested donations are $15 per person, which enables participants to receive a T-shirt, and snacks and drinks at the end of the walk. Meet time is on Saturday morning at 6:30am for registration, with start time at 7:00am. The Walk will commence at ICCI’s Campus, with a turnaround at Pedro St. James. Registration forms and payment can be submitted at ICCI. Registration forms can also be downloaded via the website www.myicci.com or www.caymanactive.com. For additional information or to become a corporate sponsor, please contact Ms. Christine Smith at 947-1100 Option 6 or email christine.smith@myicci.com . (CNS): After dozens of volunteers more than 30 bags of ocean-bound trash over 2 miles of beach recently the Rock International Open (TRIO) Cayman’s first international kite-boarding contest open Wednesday on a pristine stage at Barkers. Over 40 of the sport’s most famous athletes from around the world are here for four days of watersports action and set to put the Cayman Islands on the map when it comes to top kitesurfing locations around the world, organisers said. Featuring three separate events – Freestyle, Big Air and Racing – TRIO will put competitors through their paces. Funds raised will go towards the department of environment’s turtle protection programme. Volunteers had worked hard recently to remove seaweed and burs from the beach to allow spectators to walk amongst the trees and sit in the shade whilst enjoying the competition, Damian Davis, site manager for TRIO. "It was great to see kitesurfers, beach users, and environmental lovers getting together and giving something back to the local community by cleaning up Barkers beach” he said promising to ensure that the beach and environment will not be harmed during the contest which will add another string to the sports tourism bow. Under 16s will also get their own dedicated event during the contest and workshops held before, during and after will provide something for all to do regardless of age or skill level. 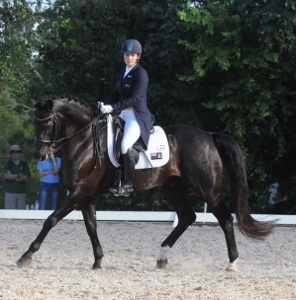 (CIEF): The Cayman Islands Equestrian Federation (CIEF) recently hosted its first ever Federation Equestrian International (FEI) CDN Dressage Show which requires at least two foreign FEI judges. The primary purpose of the CIEF hosting the show was to enable Jessica McTaggart Giuzio and her horse Ray of Light to obtain one of two qualifying scores required to compete in the Central American and Caribbean Games (CAC), which take place every four years in Veracruz, Mexico in July. 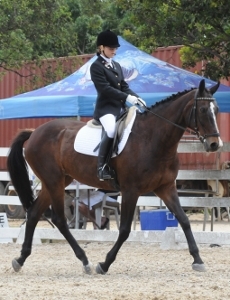 With a score of 63.62% the young rider (left) made the grade to secure a place in the regional contest. The competition was held at the Equestrian Centre on Linford Pierson Highway on Sunday 26th January. The two foreign judges were Kjell Myhre from Norway and Ricardo Rojas from Costa Rica. Both of these Judges have visited the Island several times before and are 4 star and 3 star FEI judges respectively. The CIEF was very proud when both Judges confirmed their observations of the significant improvements of both the ability of Cayman riders and training of their horses. The competition started with an official Jog of all horses, which involves all riders presenting their horses to both visiting FEI judges and appointed vets. The purpose of a jog is to ensure all horses are physically well enough to participate in the competition. The judges were also observing the behavior, physical condition and turn out/presentation of the horse. All the horses passed the jog and were therefore accepted to participate in the competition. The judges' decisions about the best presented horses were unanimous with Ray of Light, owned by Jessica Mctaggart Giuzio placing first as Best Presented Horse in the adult category and Sunday's Edition owned by Phoebe Serpell placing first in the children's category. The CIEF was thrilled to welcome back Cindy Thaxton who worked with most of the riders in the days running up to the competition. Cindy is no stranger to Cayman and has repeatedly helped prepare and train Cayman riders for important international competitions both at home and abroad. The competition proved to be a huge success and CIEF is delighted to announce that Jessica received a combined score of 63.62% in the Prix St George which exceeds the minimum score required to qualify for the CAC later this year. The CIEF will be hosting another CDN on March 8th to allow Jessica to obtain the second required qualification. Sonrise David owned by Pamela Fowler with a score of 65.17%, Anja Van Genderen (right) scoring 61.08% in the Elementary Children's class on her Cayman pony Karma, Meegan Slattery winning both the USDF B & C test that she entered on her pony Max and Phoebe Serpell who claimed the highest score of day, 70%, on her new horse Sunday’s Edition in the Children's Preliminary class. The Children’s Preliminary class was the largest class in the competition and in second place was Ashley van den Bol on her new horse EWSZ Carmella with a score of 66.98% and third place was Anja Van Genderen on Kartouche scoring 62.93%, Thea Milward stole the fourth place on her new horse Zafira with a score of 60.86% followed closely by Isabelle Smith on Edson Arantes MB with a score of 60.52% in fifth place. Sixth place was Ashley van den Bol with her second ride of the day on Pony Up with a score of 59.39% and in seventh place was Hannah Fowler on Seligkeit with 58.79%.